Pokemon Red/Blue: Often hides in water to stalk unwary prey. To swim fast, it moves its ears to maintain balance. Pokemon Yellow: Has pincers that are superb weapons. They sometimes break off during battle, but they grow back quickly. Pokemon Gold: Cloaks itself with bubbles from its mouth to make itself appear larger when it senses danger. Pokemon Silver: Pincers break off easily. If it loses a pincer, it can no longer walk sideways. Pokemon Crystal: Can absorb nutrients by swallowing a mouthful of sand if food is scarce. Pokemon Ruby, Sapphire, Emerald: Lives on beaches, inside holes that they have burrowed into the sand. On sandy beaches with little food, these Pokemon can be seen squabbling with each other over territory. Pokemon Fire Red: Can be found near the sea. Its large pincers grow back if they are torn out of their sockets. Pokemon Leaf Green: Uses its pincers as weapons and for balance when walking sideways. Pokemon Diamond, Pearl: Live in burrows they dig on sandy beaches. 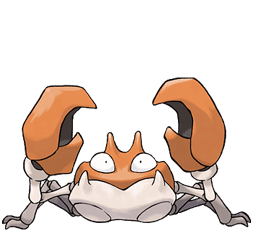 Its pincers fully grow back if they are broken in battle. Game's Description: Prevents the attack stat from being lowered. Battle Effect: An opponent cannot lower this Pokemon's attack value. This Pokemon may still reduce its attack value using a move by itself.